Everybody has finally agreed that we can call the trade dispute between China and the US a “trade war”. But there are still huge disagreements as to the cause and the potential effect. 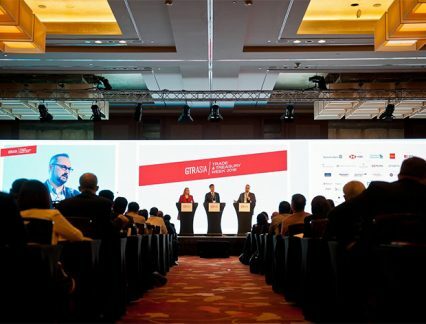 The trade war was high on the agenda at GTR‘s Asia Trade and Treasury Week, which took place in Singapore in the first week of September. Many expressed concerns over the disruption in regional supply chains, while lots of bankers were worried about the hit to their deal flow. Two American analysts speaking at the event occupy differing camps when it comes to the trade war. Deborah Elms, a lobbyist at the Asian Trade Centre, thinks that the disruption is unnecessary, while Tony Nash, CEO of Complete Intelligence sees it as an almost natural and inevitable result of a dysfunctional trading system. GTR spoke to them after they finished their on-stage debate to find out why.